How to best control grasshoppers using organic and least-toxic methods. Contains a naturally occurring protozoa that infects and kills grasshoppers -- nothing else! Grasshoppers are voracious feeders, consuming approximately one-half of their body weight per day. Both adults and nymphs cause damage by chewing on the leaves and stems of plants, and if infestations are severe, may defoliate entire fields. It is estimated that grasshoppers consume up to 25 percent of the available forage in the western United States annually. Adults (1-2 inch long) are brown to reddish yellow or green in color with prominent jaws, fully developed wings and short antennae. They have enlarged hind legs and can jump great distances. Immature stages — nymphs — are similar in appearance to adults, but are smaller and have wing buds instead of wings. Note: Ten adults per square yard are economically damaging to rangeland, according to the USDA. Smaller numbers can damage cropland or gardens, depending on crop type and age. A classic study showed that 6-7 adults per square yard on 10 acres of pasture ate as much as a cow. The injurious species of grasshoppers are all alike in their cycle of development. Eggs are deposited in late summer in elongated masses or pods inserted in the soil. These pass through the winter, and on hatching in the spring, the young seek food in the immediate area. As they increase in size and food becomes scarce, migration to other food sources takes place. After molting 5 or 6 times, during a period of 40-60 days, the adults appear and continue feeding until cold weather kills them. One generation per year in most areas. Roto-till or cultivate crops in the spring to destroy overwintering eggs. 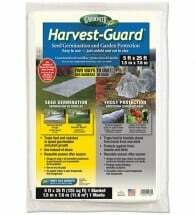 Harvest-Guard row covers can be used to cover and protect small garden areas. 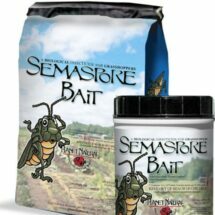 For long-term grasshopper protection, apply organic Semaspore Bait (Nosema locustae) to hatching beds – field margins and other undisturbed grassy areas – when grasshoppers are young. Heavy infestations may require multiple applications. Safer® BioNeem contains azadirachtin, the key insecticidal ingredient found in neem oil. 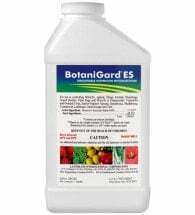 This concentrated spray is approved for organic use and offers multiple modes of action, making it virtually impossible for pest resistance to develop. Best of all, it’s non-toxic to honey bees and many other beneficial insects. 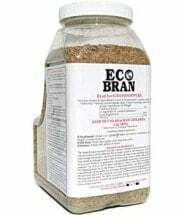 Spread EcoBran Bait or apply botanical insecticides, such as organic pyrethrins, to areas where you are experiencing heavy grasshopper damage and require a quick-kill. Read our pamphlet on How to Control Grasshoppers with Modern Baits here. Tip: Mow a “clean” strip between grassy fields and your garden area to help slow grasshopper migration. Pests are reluctant to enter the strip because it has no food, and they are very exposed to predators. A wider strip is better, especially if the adjacent area is large. 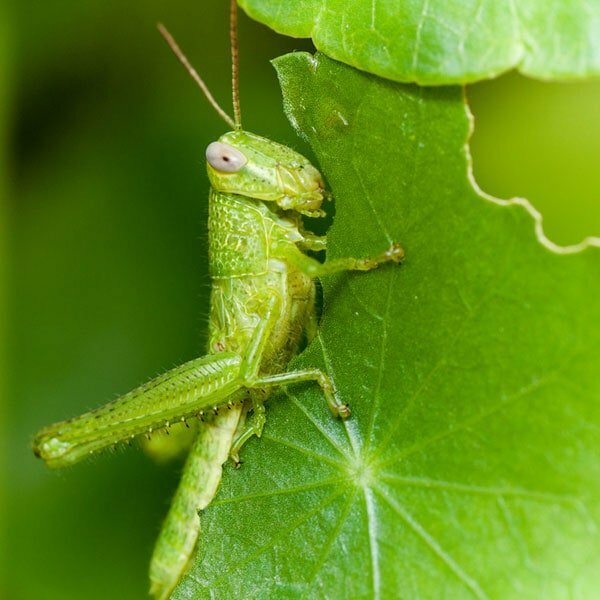 Note: A region which had a grasshopper problem in a previous year probably will also have an infestation the next year – the decline of the problem is generally gradual. Weather will affect the current year’s hatch, but USDA studies show that, on the average, much of the previous year’s problem is passed on to the next year. 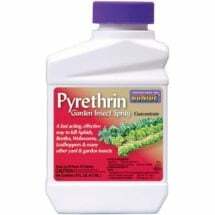 Kills grasshoppers fast and is for growers that require an immediate knock-down.